Elizabeth Olsen shared the wise advice Jeremy Renner gave her on the "overwhelming" set of "Avengers: Age of Ultron"
Working on a mega, giant blockbuster movie is one of those things that is probably realistically way more stressful than fun (remember the horror stories from the Titanic set, y’all)? 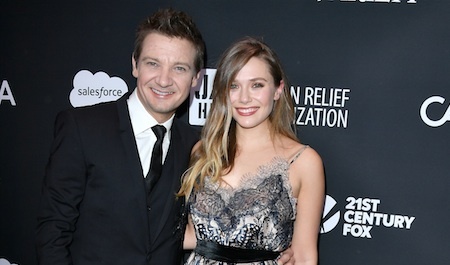 So it warms our hearts to hear that Elizabeth Olsen got advice from Jeremy Renner on the Avengers set (because let’s be real, we love it when our favorite celebs are buds IRL. It just feels right). To be more specific, in an interview at Sundance for their new indie film Wind River, Olsen discussed a time on the set of Age of Ultron when she was feeling super overwhelmed. Renner then told her how he approaches stressful, set-related situations, and Olsen said it helped her view her surroundings in a new way (and also, allowed her to bring that perspective to new projects). "It's just problem solving. There are a set of obstacles that you have, and how do you navigate them? It's problem solving the obstacles," Renner said in the interview. Olsen said that this advice broke down what they were doing in “a very human way,” and allowed her to focus on tangible goals right in front of her (as opposed to feeling crushed by the pressure of a multi-million dollar franchise). She also said that she tackled her current, much smaller film in the same way. And huge movie franchises aside, this advice actually sounds pretty great for any overwhelming situation in life, so we’re pretty glad we got to hear it. Thanks for sharing. guys! And in case you’re curious, their new film Wind River is about a rookie FBI agent (Olsen) who hires an expert tracker (Renner) to help her solve a murder on the wilderness lands of a Native American reservation. It’s apparently tough, dark, and bleak (so maybe don’t go when you’re in the mood for a laugh). A release date has yet to be set, but we’re pretty excited to see this team in action.